It wouldn’t be a tropical plant display without a banana plant showing those huge luxuriant leaves. 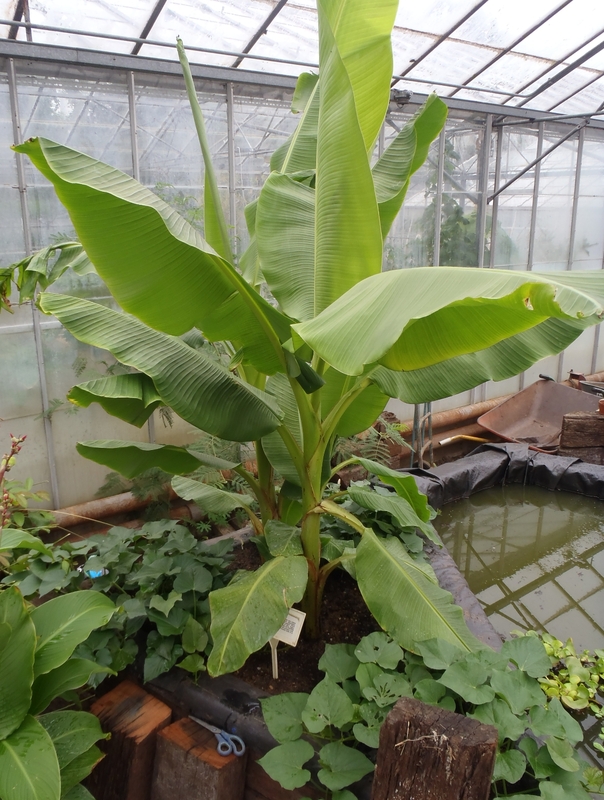 Dwarf Cavendish bananas are low growing which makes them wind resistant when grown outside and means they fit under a greenhouse roof when grown inside. Our plant has been cultivated at Reading University for many decades and formed part of the tropical crops teaching and research of Dr Barbara Pickersgill until she retired. Those of you who read Dutch will find an excellent article on Barbara on the Dutch Wikipedia site. For others there is a report of the Linnean Society meeting held to honour her retirement in 2006. This entry was posted in Asia, Crops, Species. Bookmark the permalink.